An exhibitor prepares a display at the RHS Chelsea Flower Show in London, Britain May 21, 2017. Only in England would a garden show need to issue a stern warning to would-be ticket resellers. But the RHS Chelsea Flower Show regularly sells out weeks in advance, attracting about 165,000 visitors. It is a major event on the British spring calendar: The BBC airs endless TV specials and international celebs parade through the grounds of London's Royal Hospital Chelsea (among the bold names spotted this year: Dame Judi Dench, Rupert Murdoch and Jerry Hall). Still, the real stars of the show are the 500 exhibitors and thousands of fragrant, blooming flowers. There is something to be learned from all the gardens – even the ones that are delightfully over the top. If you can't find inspiration here to keep your green thumbs busy, it might be best to find a new hobby. Here are a few of the best trends spotted this year. Greenhouse companies, such as stalwart Hartley Botanic Inc., figure prominently at Chelsea, assembling their best models for the public to see and making one fervently wish that the same breadth of variety were available in Canada. 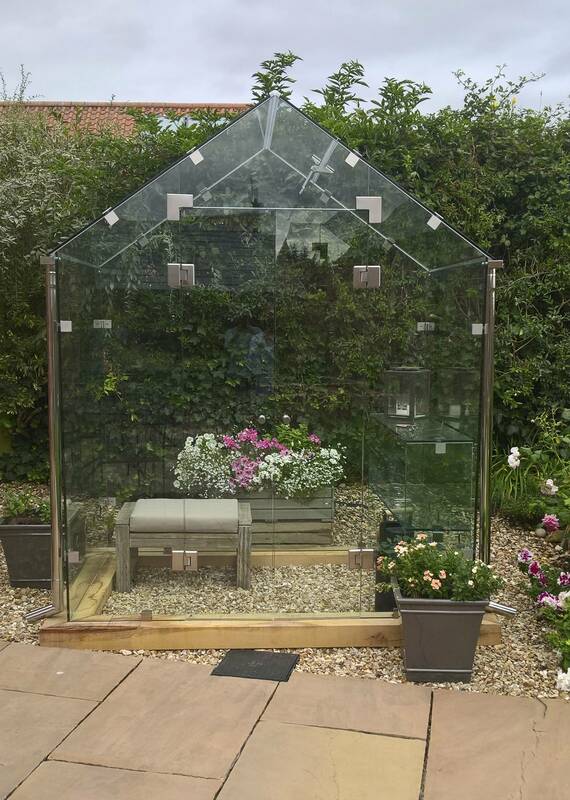 The first frameless greenhouse by Pure Greenhouse (puregreenhouse.co.uk) had everyone talking this year, because of its enviable seamless interior, modern ventilation system and crystal-clear design made from 10-mm toughened glass. It also happened to win the RHS Chelsea Garden Product of the Year 2017. Metal was sculpted into everything from alliums to echinacea. Garden art, of course, is entirely subjective, but various styles stood out, from James Parker's beautifully rounded slate sculptures that came in apples and ovals, to Emma Stothard's life-sized willow and wire animals. These works of art deserve a bigger yard or public space to shine. There were plenty of small-space-appropriate options, too. Metal was sculpted into everything from alliums to echinacea. Even trellising and plant protection was treated to curly cues and flourishes, to distinguish it all from the typical garden variety of bland metal ornamentation. Charlotte Harris deliberately chose hard materials to evoke the boreal forest’s ecology and geology. We've seen copper indoors via lighting fixtures, faucets and other accessories. At Chelsea, copper was incorporated into various garden installations. Charlotte Harris, who designed the Royal Bank of Canada garden with her all-female team, deliberately chose hard materials to evoke the boreal forest's ecology and geology. The inside of her modern larch pavilion is lined with copper. In the Seedlip Garden, copper piping demonstrated a 17th-century approach to distilling non-alcoholic spirits. And copper hues were evident in the rusted elements of various plots. For example, the three water-filled tubs in the Zoe Ball Listening Garden were rusted to a nice copper-ish patina. The leaf-shaped loggia created for the Morgan Stanley Garden. Every sunny yard necessitates some type of shade protection – especially if we're in for a hot, sunny summer. There was the Charlotte Harris pavilion, as well as the leaf-shaped loggia created for the Morgan Stanley Garden. This look could be recreated and supported off the back of a sturdy brick home. The Anneka Rice Colour Cutting Garden featured an open-air shed structure – a perfect place to pot or sip a cup of tea. Patio furniture was elevated beyond the typical big-box offering and in many gardens was used as an art form to illustrate the contemplative quality of a garden. In the Poetry Lover's Garden, a metal lounger balanced upon a sphere. In the Gaudi-inspired Viking Cruises Garden of Inspiration, a white geometric chaise stood in stark contrast to the colourful, art nouveau mosaic that ringed an orange tree. The furniture in the 500 Years of Covent Garden space evoked that thin, pale pallet-wood vibe. 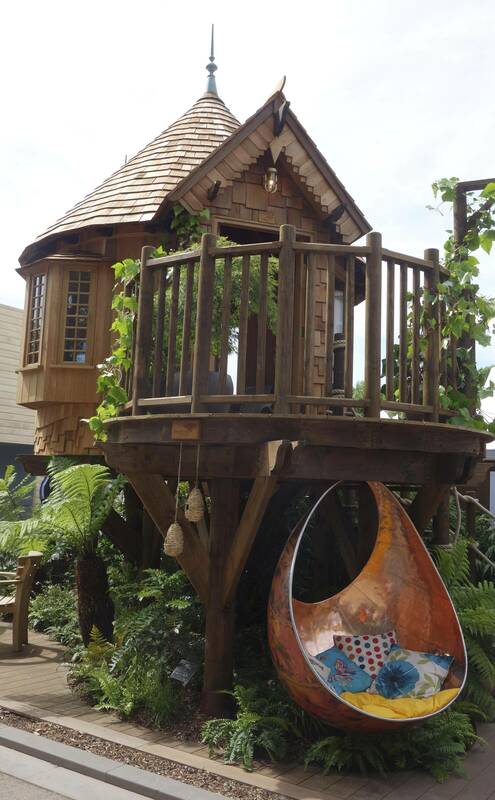 A couple of garden displays featured teardrop seating, swinging from a strong overhead support. And the Jeremy Vine Texture Garden simply provided domed rocks upon which to perch. Innovative ideas remind us we just need to use a little imagination to carve out space in urban gardens. Urban gardening can present its challenges when square footage is low, but innovative ideas, such as those presented in the RHS Greening Grey Britain Garden, remind us we just need to use a little imagination to carve out a space. A rain garden was included in the design to demonstrate how to deal with flash flooding and conversely drought-tolerant plants were used throughout. Bins and bikes proved not to be obstacles, as a mini rooftop garden was built right overtop of the bins, while the bikes got their own mini-driveway between flower plantings. Another garden that featured that " unpaving paradise" concept was the M&G Garden. Inspired by a Maltese quarry, its visual design lessons are more esoteric, but once you understand its overall lesson of preservation and regeneration, you could apply it to the revitalization plans for any harsh, concrete urban landscape. Fruits and vegetables are being snuck into traditional ornamental gardens. With garden space at a premium in many urban lots, fruits and vegetables are being snuck into traditional ornamental gardens, or being presented as the stars of the show. Front-yard edible gardens are becoming more the norm because, sometimes, that's the homeowner's sole optimal food-growing area (one that gets six to eight hours of sunlight that heat-loving veggies, such as tomatoes, need to thrive). A new book this spring calls it The Foodscape Revolution. At Chelsea, the Chris Evans Taste Garden, part of the BBC Radio 2 Feel Good Gardens appealling to the five senses, colourful Swiss chard and lettuces, and tall, frilly purple and green kale varieties proved their ornamental value alongside the flowers in an edible garden. And fennel, of all things, was used in more than one garden as a frothy, feathery foliage to complement other fuller, leafy greenery and the colourful blooms on display. Colourful lupins were a predominant bloom, along with alliums, plume thistle, foxgloves and more. Cutting gardens have increased in popularity, thanks to Instagram inspirations, such as Floret Flowers. Colourful lupins were a predominant bloom, along with alliums, plume thistle, foxgloves and more. Of course planting all these gems attracts and benefits the pollinators, too. Insects got a bit of attention, with elaborate pollinator palaces and insect hotels constructed as habitat.